Rare and unique is this opportunity, this 2.4 acre property would usually be found in rural Auckland not in Albany! 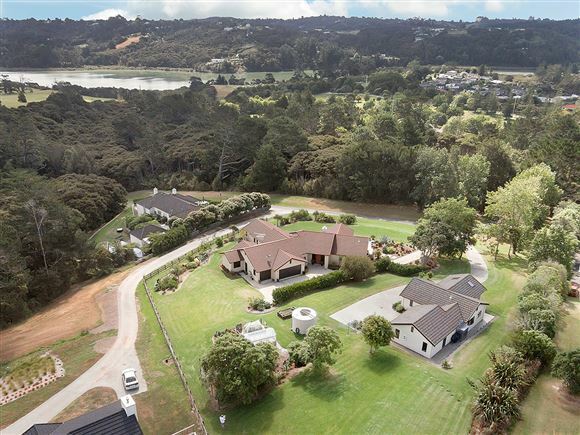 North facing and comprised of an expansive 5 bedroom single-level home as well as an entirely separate contemporary 2 bedroom minor dwelling, the estate is located down a private ROW and framed with lush lawns and mature tree canopy with wonderfully elevated views. Stylish interiors, a MasterChef style kitchen has been designed with 'the works' including a large walk-in butler's pantry. A double sided glass fireplace divides the family living area and the exclusive formal lounge. There are 5 bedrooms throughout, four doubles and one single. The master suite has its own walk-in-wardrobe and large tiled ensuite. The family bathroom is cleverly placed in a central position for easy access from the other 4 bedrooms. Outside a mix of covered and uncovered outdoor areas are perfect for family living and entertaining. Soak in the spa and admire the view that reaches as far as Lucas Creek. The grounds see a mix of tropical landscaping, vegetable gardens, implement shed, shade house and a collection of fruit trees. Triple garaging and plenty of parking completes the main estate. With its own driveway, off street parking and double garage, the completely separate minor dwelling is finished to a very high standard. Including two bedrooms, lovely modern kitchen and open plan living including a covered Portago entertaining area. The vendors are downsizing and committed to selling, this is a truly unique opportunity not to be missed. Call for appointments to view! Chattels remaining: MAIN HOUSE CHATTELS: Blinds, Drapes, Fixed floor coverings, Light fittings, TV aerial, Sky Dish, dishwasher, Westinghouse double oven, Gas cook top, Range-hood, Electrolux fridge in kitchen, Alarm, HRV system, Heated towel rails x 2, Gas fire place, Garage remotes x 4, Spa pool, Sound system & cabinet in formal lounge, Pioneer TV in wall, 7 chickens. MINOR DWELLING CHATTELS: Blinds, Drapes, Fixed floor coverings, Alarm, Electric hobs, Oven, Garage remotes x 3, Light fittings, Dish drawers x 2, Heated towel rail x 1.